Service Costs > How Much Does It Cost to Cut Glass? How Much Does It Cost to Cut Glass? Custom cut glass allows you to choose the size, type, edgework, thickness and shape. 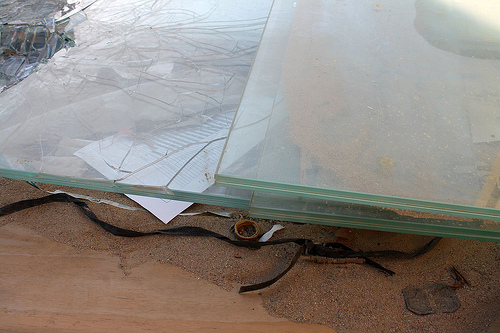 Whether it’s for a customized glass table top, mirror, shelf or as a replacement for cracked glass, the costs will vary based on the factors mentioned above. How much does custom cut glass cost? The costs to have a professional cut glass can be anywhere from as little as $2 to more than $25 per square foot. As mentioned, the costs will greatly depend on the thickness, the type of glass and the company you choose. We talked with a few glass companies online and were able to receive quite a few estimates, which we included in our table below. On this Gardenweb.com forum thread, members discussed what it would possibly cost to cut a customized piece of glass for a wood table. According to the responses, most said it could cost anywhere from $30 to $75 for the job. When customizing, a glass cutting service, before they are able to offer a quote, will want to know which type of shape best describes your glass, the measurements, the thickness, glass tint color, the edgework, if you require a logo and if you need any holes drilled or cut out. Thickness Options (greatly depends on the type of glass) - 1/8"
Typically, most jobs, depending on how busy the shop, will take five to seven business days to complete. Polishing the edges, once the glass has been cut, can be an additional cost. The same can be said about drilling holes. Each hole that needs to be drilled can cost close to $20 to $30 each, on average. Call a few local glass dealers and even check with online retailers as well to see who can offer you the best price. While you don’t solely want to focus on the price, be sure to pay close attention to their reputation, the reviews from past customers and the options they can offer when creating your new custom glass piece. You can cut your own glass at home, but these tools are recommended for smaller glass projects. Popular tools on Amazon.com often cost less than $15.